Fly fishing is no extreme sport. Just look at us. We couldn’t extreme anything. 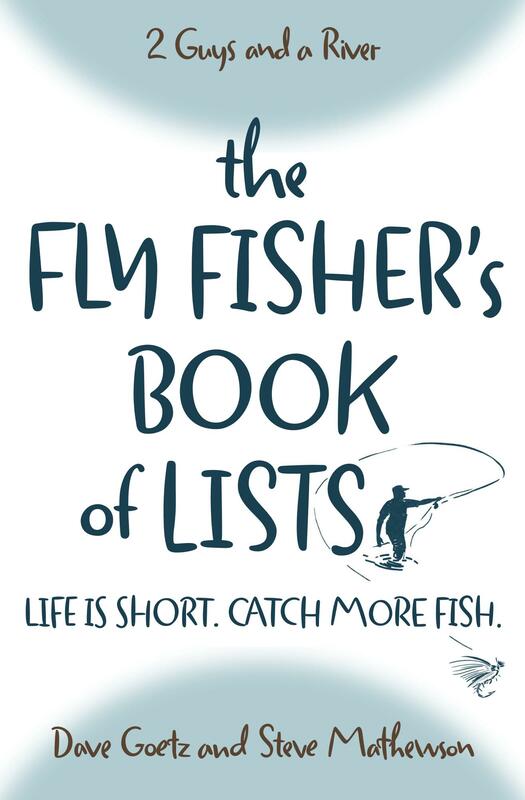 But fly fishing offers a few ways to die (drowning, the most obvious), and many ways to ruin a day on the river. Listen to Episode 43: 5 Fly Fishing Dangers as we identify a few fly fishing dangers. We also make several recommendations so that your next trip isn’t your last. We’ve recently introduced a feature to our podcast – “Great Stuff from Our Listeners.” At the end of each episode, we read a few of the great comments from the blog or from Facebook. We love the idea of adding your ideas to the creative mix. What dangers did we miss? Do you have any great stories to tell? We’d love to hear from you. I would have to add, always wear glasses when fly fishing. When false casting especially on a windy day the last thing you want is your fly in your eye. As a guide, always ask clients if they have any medical conditions or physical limitations that might affect a trip. We can plan your trip accordingly and be better prepared to look for certain symptoms. As you mentioned lightning and hypothermia are major concerns. Make it a habit to stay on top of the weather forecast for the area you are fishing in. Getting caught in a snow storm or heavy rain that may cause rivers to swell fast is very dangerous. Like the Boy Scouts say, always be prepared. Wow, terrific addition with the glasses. And great question about medical conditions. Thanks so much for your wisdom, really appreciate the post. I’m 75 and still fly fish in some slippery river bottoms and dangerous terrain for elusive trout. I can safely avoid the obvious but sometimes can’t see the underwater hidden slippery rocks. A wading staff is a necessity for me and I always anticipate stepping on one. This audio information is very important for people to follow. Wading staffs, belts, and any other safety precaution can be your key to the future. This is one of the best articles on this site. Especially for fragile old timers. I was confronted by a grizzly in Alaska but faced it and didn’t run. It came so close that I was about to drop to a fetal position when he stopped, stood upright a few moments (forever) then moved into the brush. My legs gave away and I dropped to my knees. When I gained control I slowly walked to my airplane and heard it follow me all the way. Everyone should read and learn what to do to when confronted by a dangerous animal. Just listened to your safety tips for anglers. I always learn something from you. The conversation has “MUST DO” information for anyone in the water or outdoors. Folks, and use them. Stepping backwards in the water or on land is not the best idea. Wading all live water, I depend 100% on my feet and wade staff to read the bottoms. That’s our eyesight underwater. Don’t step up onto larger rocks underwater or above water when crossing or working a river. I have two prs. of boots, both felt but one has studs. I use only the felt because of the added noise studs make on smaller waters. Smaller waters, heed the same precautions. You need to know what is on the other side beforehand. Runoff waters can clear out and fill holes around structures. Don’t gain a false sense of security. This is an age problem. What foolish things we did as teens and pretending to yourself that you can do it again. Studies have shown that men think they are 16 years younger than the date on their drivers license. Look at it before getting out of the car if need be. I’ve put myself in trouble far too many times and I am just lucky to be here. Standing naked in the woods, wringing out my only clothes. Not why I flyfish. Growing up was tennis shoes and cutoffs in cold spring water. Tying burlap sacks around our shoes was the version of felt at the times, and about all you can do to stand on slate. When the burlap gets impregnated with dirt and debris, you had to stop and clean them. I own a river canoe, so I have two CO2 inflatable life vest, meeting USCG regulations. There are other inflatable life vest available, far less cumbersom. You may have to look in bass shops or online. I have not tried to wear one with a full fishing vest. What Steve and Dave said about using two wade belts. That is just smart. I have two in my gear but one is neoprine which is only good to hang my wade staff from. I will buy another before fishing big waters. Thanks guys! The things you talk about in this episode and others, will save peoples lives. I learned about the two wade belt system. I’m 67 and I still learn, even on dry land. I was called by a jounalist friend to comment regarding a young girl who drowned on a large tailwater. Her uncle wanted my friend to write about the dangers of hip waders. I could not honestly reply and hurt him more, so I declined the interview. Her first fishing trip with friends after weeks of instruction from her uncle. We are responsible for our safety, not nature. We should be familiar with our surrounding. Even if it is the first time. Our experiences should never take this for granted. Bear spray should not be worn . You might have a few seconds before it’s too late. Rattle snakes begin to mate in April in NM and CO and they are readily found along the river banks. Don’t be fooled thinking that neoprine will protect you. If it’s a cougar, remember that they are ambush predators. You can’t really prepare for them. Packaging advertisements on bear spray used to say “Bear Repellent.” A woman in CA. read this and like insect repellent, she sprayed her children. Repelling bears? NO! Attracting bears? YES! As a guide, I may have other guides and several sports. When the lightening storms roll in. You have little time to respond. Getting caught in open meadows is not where you want to be. Hold your rod horizontal to the ground. Get under trees and out of the open sky. Spread out 100 ft. from each other. It’s safer than being in open space, perhaps not under the tallest tree. I was fishing on Lake Powell in Arizona. People in boats with CB Radio’s would talk and the electrical signal came down my flyrod and was arching onto my finger tip from many miles away. Be careful to know where dry lightening occurs regularly too. Flashfloods are or can be your biggest surprize. In the moutains, you just need to be aware of unusual amounts of debris and rising waters. You may not see a cloud. Possibly a beaver dam broke. Get to higher ground. In very large open range areas, you may see a storm 100 miles away. You get into the canyons and thinking you are safe is very wrong. Flash floods caused by a storm can come instantly. Utah and Arizona canyon lands for example. Canyons or arroya’s. If you are in the mountains in arid climates. Dehydration and altitude are factors to be added. Be safe and return to do it again. Wet lines! Awesome stuff. I am in my first season as a guide and I really appreciate your post. Always let someone know where you’re going and when you plan on coming back. If something happens, at least someone knows to call you to make sure you’re still alive or to call for help and let emergency responders know where you are. Yes, that’s important advice. Thanks! I’m following your podcasts every week: I think you are doing a good job! I’ve listened to episode #43 again and I want to add a suggestion. Sometimes I leave my wading stuff in my car and when it happens and my car is too far, I look for a good stick along the bank or close to the river, before crossing it. Then I leave it along the opposite bank so if I have to go back, it’s ready to use. That’s a killer idea … maybe even qualifies as a “fly fishing hack”! I thought about that after a bath in the Roaring Fork, CO. In fast water it can help a lot and I do the same here in Italy when I go fishing in the Alps. what do you catch in the Alps? And how big are the rivers? I catch brown, marble trout and grayling. You can also find rainbow in some places: as you know this isn’t a native fish for us and is from the fisheries. We have small creeks and rivers that can be big like the Madison in MT. The average size is like one of my favourite in CO: the Pan. You can check some pics at http://www.fireyrod.com : I collected photos from 2004 till now. Many are from Alps, CO and there are some in the 2005 section of the MT.